This Hungarian-made .32 ACP ammunition is great for training with pocket carry pistols like the Kel-Tec P-32, Walther PPK, and other .32 firearms. It comes in a volume priced box of 1,000, packaged in 20 boxes of 50 rounds each. These rounds use a 73 grain full metal jacket bullet, non-corrosive Boxer primers, and reloadable brass cases. 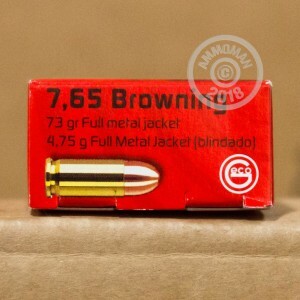 A highly popular police and self-defense cartridge in Europe, the .32 ACP (sometimes called the 7.65mm Browning after its famous designer, John Moses Browning) fits in a variety of very handy, discreet firearms that trade raw stopping power for discretion. Perhaps for this reason, Ian Fleming made the .32 ACP Walther PPK one of James Bond's signature weapons. The .32 ACP PPK is also notable as the gun that killed Adolf Hitler. The .32 ACP has also gained traction in the US in recent years with the rise of concealed carry and super-compact pocket guns offered by manufacturers such as Seecamp, Beretta, and Kel-Tec. 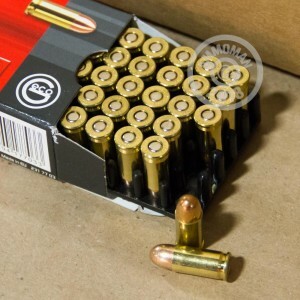 Buy this GECO ammo or any of our many other "by the case" centerfire and pistol ammunition to receive FREE shipping, a discount that gets bigger the more you order. 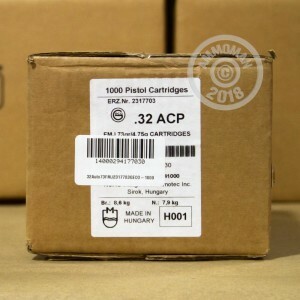 5 minutes at AmmoMan.com could save you 15% on ammunition costs!